The Tube Mount Antenna Base can be used with any 1" OD stainless tubing allowing custom antenna mounts. 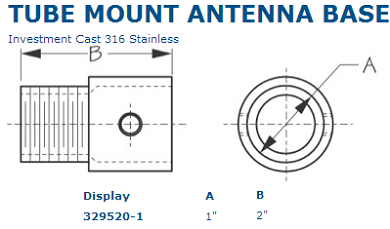 When used with a stainless deck fitting such as Sea-Dog part number 280901, antenna extensions of any length can be made with a full length passage for coaxial connectors. Attaches to tubing with two 1/4" - #28 x 3/16" set screws which are included and is threaded for standard 1" - #14 threads.